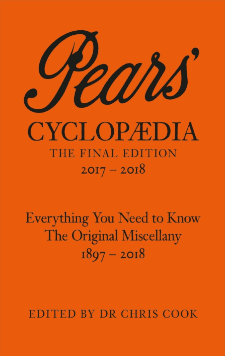 Pears’ Cyclopædia 126th and final edition. I have a weakness for reference books, and I own too many. I have an Encyclopædia Britannica, a Webster’s Third New International Dictionary, and a huge, 20-volume Oxford English Dictionary. But one of my favorite references is also one of the smallest - Pears' Cyclopædia. I own a few copies of this unusual, annual, British reference although my most recent version is more than five years old. Last month Penguin announced that the new edition, the 126th, will be the last. I stumbled on the story at the Guardian. Pears' is a very British reference book, so that's no surprise. I've never seen it in bookstores here in the States. I first heard mention of it around ten years ago, possibly in Kister's Best Encyclopedias though I'm not sure. Let's hope I didn't read about it on Wikipedia. Regardless, my curiosity for reference books got the best of me, so I ordered a copy. Despite the name, Pears' is more of a miscellany (as it admits right on the cover) than an encyclopedia: part compendium, part yearbook, and part bathroom reader. The book is divided into thematic sections like an almanac rather than being indexed alphabetically like most modern encyclopedias, and some of the sections rotate in and out over the years. This system sometimes makes it difficult to use despite the publication's claim to be "the only reference book you'll ever need." That's a bit of good old-fashioned marketing hyperbole, but Pears' runs to about a thousand pages and covers a lot of ground with its tiny font. There are bars of Pears soap and a thick book called Pears' Encyclopedia, which keeps me up day and night because it tells you everything about everything and that's all I want to know. And that's how to use Pears' Cyclopædia. Dr Chris Cook has been editing Pears' Cyclopaedia since 1977: the year of the Queen's silver jubilee, James Callaghan and The Clash. The world has changed since then, but Pears'remains the only book of its kind to be updated and revised annually. But it will be updated and revised no longer. Pears' is going the way of most reference books. This feels like the end of an era, not just a publication. Pears' Cyclopædia doesn't have any direct competitors left. The Hutchinson Encyclopedia went digital-only several years ago. Whitaker's Almanack is still around, but it's more a UK version of The World Almanac than a miscellany. Here in the US, the last edition of Schott's Almanac came out in 2011. Britannica still publishes their annual Book of the Year, which seems odd considering they stopped publishing their physical encyclopedia years ago, but it's not the same thing either. So I'll be ordering a copy of this final edition although I don't have the shelf space. After that, we'll have to rely on Wikipedia and Youtube videos to get our fix of useless knowledge.